Before worn and failing exterior doors can compromise your home’s look and feel, be sure to invest in a better and longer-lasting solution—door replacement. This project offers many benefits that easily improve the beauty, comfort, and energy efficiency of your home. Great timing, however, is essential. You’ll want to make the most of your door’s remaining service life, and the same time, you don’t want to wait until enough damage has occurred to go for replacements. Renewal by Andersen®, your premier door contractors in Las Vegas, NV, share the telltale signs that it’s time to replace your existing doors. Difficulties in Operation — Old and failing doors are prone to sticking and jamming, making it hard to close or open your doors. It might be time for a replacement if you’ve been noticing these in your doors lately. After all, difficulties in operation can indicate something more serious, like warping. When extreme thermal changes cause your doors to shrink or expand, it results in warping and gaps between the door and the threshold. This eventually leads to a stuck or jammed door. You can also check your doors’ hinges for signs of wear, as this can be another indication. Visible Signs of Damage — Age and harsh weather can be harmful to your doors, causing them to form cracks, warps, and holes. Add fading or peeling paint or broken glass to the mix and your doors won’t be earning compliments anytime soon. Your experts for door installation in Las Vegas, NV, Renewal by Andersen® suggest that you replace your doors when they already show extensive physical damage. Cracks and holes make it easy for costly heating or cooling energy to leak out of your home, leading to high energy costs. Renewal by Andersen® of Las Vegas is the premier door company that homeowners trust for their door replacement. We offer only the highest quality entry and patio doors that help maximize your home’s beauty, comfort, and energy efficiency. These include our hinged French patio doors that add a touch of class to your rooms. 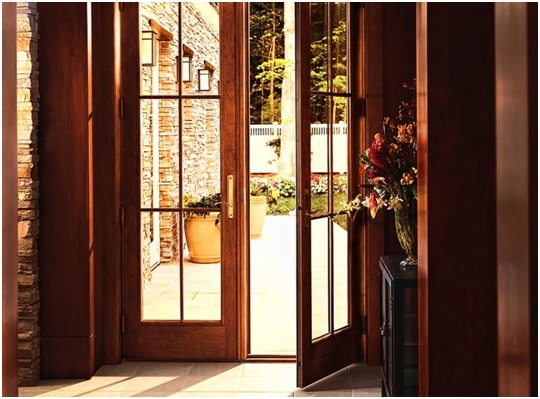 These doors also have a wide opening that creates a more seamless connection between your interior and exterior living spaces. For doors that combine elegance and convenience, choose our sliding French doors in Las Vegas, NV. They operate smoothly and easily through durable track rollers. Their space-saving benefits also make them attractive home features. Turn to Renewal by Andersen® of Las Vegas for your door replacement needs. Fill out our form today for a free estimate.